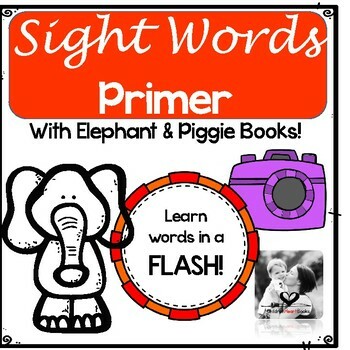 Sight Words in a Flash is a great system of learning forty primer sight words using Mo Williams Elephant and Piggie read alouds! I love using literature to introduce sight words to my class and help make the connection that these are words that they will learn to help them read and write in a Flash! 1. 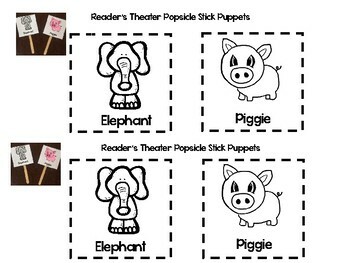 Sight Word Weekly Lesson Plans for 10 weeks featuring one Elephant & Piggie Read Aloud and 4 sight words each week. 2. 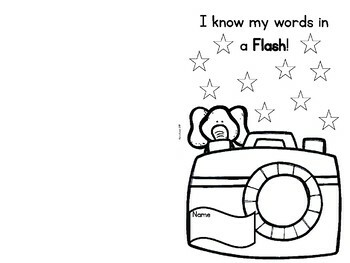 "I Know My Sight Words in a Flash" booklet (editable words). Students use this to work on their sight words. Students color one star on the front of the booklet for every week they master their words. Best part: This booklet is editable! If you have students reading first grade words or pre-primer differentiate and put in the words they need for their booklet! Students can keep this booklet to guide them in centers and know exactly what words they are to practice that week! 4. Sight Word Flash Cards. Editable. Make these match your words for the week. Print on cardstock for durability or have students glue to index cards. Each student has a ring to put their cards on for individual practice to bring home or keep at school. 5. Sight Word Search Printable. Students read books and search to find their sight words for the week. They write the word they find and page number. Great for library. 8. Flash Word Race Game. Put in eight words (two weeks) and it populates the other words to save time. Students roll a dice, move their counter, say the word. If they can’t say the word they move back to the start. 12. Dictation Paper Elephant & Piggie style. 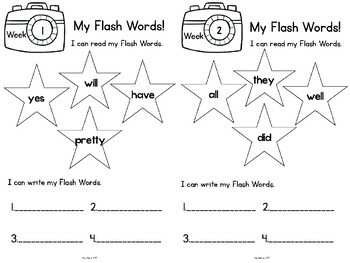 Say the sight words for students to write or simple sentences with the sight words. 14. Sight Word Printables. Editable so again you can differentiate for your students!. The printables are read, trace, color, write, tell a friend a sentence using the word, and glue the letters. It can be an interactive notebook page too! Students can cut it out, glue it in their notebooks and lift the flaps to get extra practice writing the words. Pigs Make Me Sneeze! ; Should I Share My Ice Cream? ; My New Friend in So Fun! ; Listen to My Trumpet! ; Let's Go for a Drive; Waiting is Not Easy! ; A Big Guy Took My Ball! ; My Friend is Sad; Watch Me Throw the Ball; I Will Surprise My Friend! Lots of sight word learning fun with Elephant and Piggie books! Enjoy!